Please remember these safety tips when traveling on or around the VTA bus or light rail system. LOOK both ways before crossing our tracks. Watch for warning signs and stay behind the yellow line when you’re on a light rail platform. Remove your headphones and LISTEN for the light rail train and any audible warning signals that let you know a light rail train is approaching or a bus is approaching a stop or intersection. PAY ATTENTION to warning signs and street and pedestrian crossing gates. They are there to protect you and remind you to only cross the tracks when it is safe to do so. For more safety tips, watch and share our new safety video! 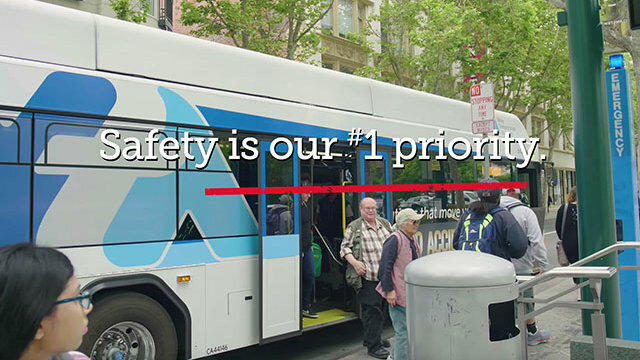 In September, VTA Safety and Security launched a campaign to remind the public about the importance of moving safely on and around our light rail system. The Santa Clara County Sheriff Transit Patrol conducted enforcement operations at three locations along the Winchester Light Rail line. The operation resulted in 16 citations for various safety related vehicle code violations. The most common violations were red light running and distracted driving. The operation also included a rail safety awareness education campaign for students for students in the area. According to Nancy Sheehan, the state coordinator of California Operation Lifesaver, a non-profit safety education and awareness program dedicated to ending incidents at highway-rail grade crossings and on railroad rights of way, there were 114 deaths and 89 injuries of railroad trespassers in 2017. There were 38 rail-crossing fatalities and 58 injuries the same year. Safety is everyone’s job. We encourage you to follow the rules and help spread the word so that others do as well.